Chung Hyun Kyung must win the prize as the most intriguing speaker at the Epiphany Explorations conference. 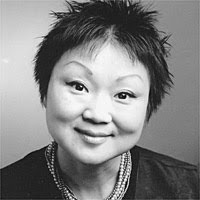 She is a Korean-American, eco-feminist, Christian Buddhist (or Buddhist Christian.) Not only is she in select company with that combination, she may be one of a kind! In one session she described to us her journey toward bringing together both Buddhism and Christianity as her faith expression. In the other, she told us about a recently completed project which involved travelling to seventeen Muslim countries where she interviewed 200 Muslim women about peace. Chung is an engaging speaker and her presentation on her encounters with Muslim women was enlightening. Lo and behold, in each country she visited women were treated differently. In Turkey Muslim women had great freedom in every aspect of their lives while in Pakistan it can be extremely dangerous to be an independent woman. One woman she spent time with in Pakistan had been gang-raped for her outspokenness. She ended up suing these men, which was unprecedented, and she won in large part because the local imam supported her cause as one of justice. The woman used the money of the settlement to build a school to educate girls. A woman in Syria is a Hezbollah warrior, convinced that the only way to freedom is through armed response. Chung`s talk reminded me that I should refrain from stereotypes. There is no more a typical Muslim woman than there is a typical Christian woman. Does this surprise you? Encourage you? I guess it shouldn't be surprising. What a collection of difference! I often think stereotyping results from our human compulsion to categorize, slot, or otherwise understand the foreign through relative compartmentalization than anything else. It's ultimately quite an intellectually lazy thing to do; then again, we've all done it at one time or another. I don't think this will surprise any women.